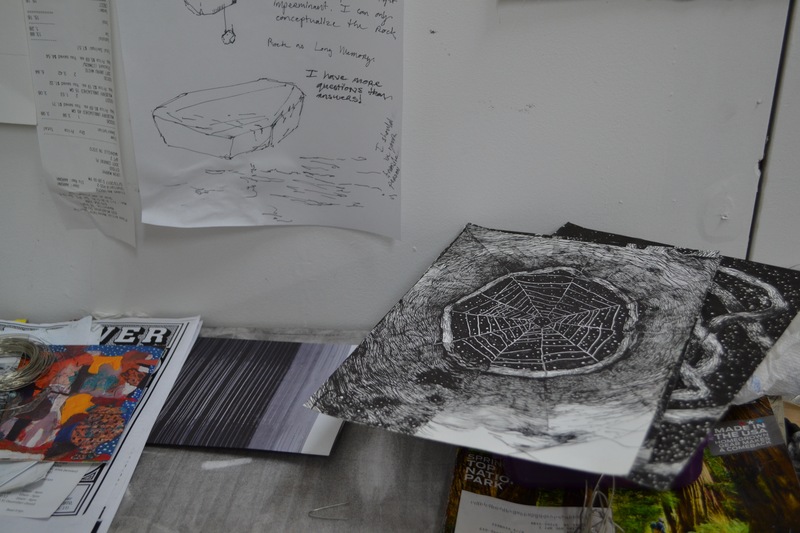 The first in our series of interviews with Ground Floor’s studio mates, Erin Murphy is an artist deeply invested in exploring materials and diverse methods. Despite the emphasis on medium, you can easily describe her work as poetic. She is focusing her attention lately on rubbings similar to frottage. It is not a basis for a new drawing, but rather an impression of a place, a way of memorializing. 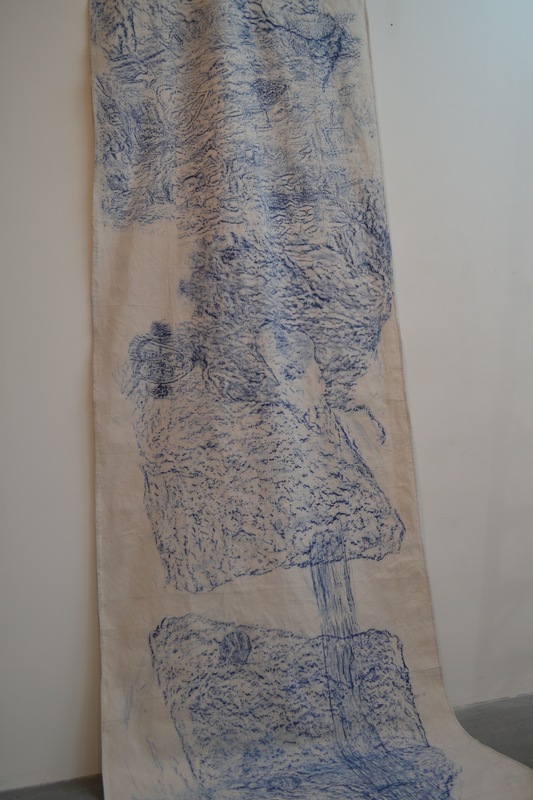 She leaves her studio to take these rubbings of places that interest her- laying canvas down and rubbing over them with either graphite or construction wax. I met up with Erin to talk about this frenzy of new work, and we also discussed her other endeavors in drawing and painting. Below are slightly condensed portions of my conversation with the artist. Erin: This is taken from that border/boundary of Fort Negley. It runs from Fort Negley to the Adventure Science Center. What’s printed on top of that is what I had wrapped around a place at the Old Stone Fort that has love trees, like those trees that people like to carve their names into. Those parts of the tree are overlaid with the boundary of Fort Negley. E: Old Stone Fort is outside of Murfreesboro. I actually went to go do boulders there but Old Stone Fort is fairly misleading with how much of the fort is left. It’s more like a place where you can stand and imagine where the Old Stone Fort used to be-when it was there…potentially? One of the only things that was visually interesting to me there were these carvings in the trees. But I’m glad that that happy accident happened. There is plenty of meaningful contemplation to be had by taking from these two disparate places and conjoining them. In this, you could be invited to rethink politics as two histories are combined with a tragic commonality. You also could see the beauty in it, because after all, she did add love trees. E: It makes me think of the trees as a different kind of monument. There is one that is meant to be social or historic. I think that’s what was interesting to me about doing this. I’m documenting something specific, it is the literal impression of something. They help me focus on that rock rather than a philosophical representation of a rock coming from just my imagination. I tend to romanticize objects and have a folder in my head that I usually am working from. So this has been nice to get really specific. Sibley: So you’ve never done rubbings until now? E: Not really. They started as a way for me to get out of my studio. And I used to do a lot of monoprinting in school so I definitely like the idea of the “one off” kind of thing. I’ve done a lot of metal casting, so taking impressions of things and making a mold. So I guess I was thinking of way to do that that didn’t involve casting. The first one I made was when I was working at the foundry and I had a really “rustic” studio. I was an intern so I had the shittiest space in the back. I was working on these big drawings and the woodgrain on the studio wall was so prevalent that I couldn’t make drawings on them. I was getting really frustrated, and one night it was late and hot and I was getting swarmed with mosquitos so I just kind of scribbled over the whole piece. Came back the next morning and thought it was an interesting thing. S: Are you trying to find connections between the different places, or are you just sort of looking for interesting textures? E: I’m looking for texture and that weird gut feeling that those things are connected but not necessarily specifically. Like the connection with the boulders and love trees; they’re both these relics that nobody really cares about anymore; they’re both things that are within my path as I’m thinking about them; they’re both things you come back to later and see the process of wear or change. That’s what I really enjoy about the work, these things come together and each lend meaning to other aspects or shift your perspective on the thing you’re looking at. But there are other things I really like about it; it kind of feels like water or almost an abstraction of something, like there’s a sense of movement to it but they’re both really still solid objects. S: Yeah when I first saw it at a glance I thought it was an abstracted chinese landscape scroll. E: Yeah I like that scroll aspect of it. 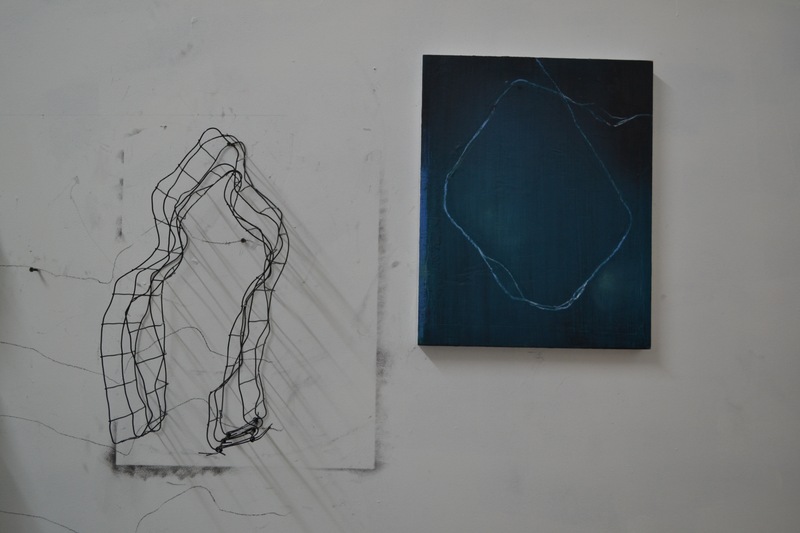 When I first started them I was using canvases that matched the size and shape of the objects. They are also an excuse for me to be allowed to come in and poke around old buildings. They let me in the Belcourt before it was refinished. And I think I wanted it to be some kind of preservation, like I could be precious with things and memorialize them, but that’s not the feel that these have. So I kind of gave up on sort of cataloging these things, there are much better ways to do that. And because a lot things are too fragile for me to do this with. 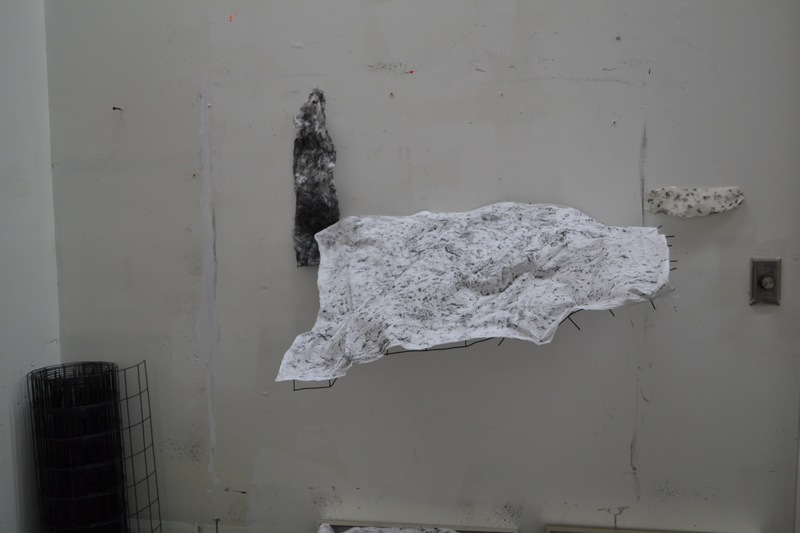 In the Belcourt there was some plaster and paint that was coming off and the friction would actually damage them. I don’t want to have to break the thing I’m taking an impression on so that kind of limits what I can look at to things that are hardy and can stand the test of time. S: So it’s wax that you’re using? E: It’s construction wax that they use for metal and wood at constructions sites so they know where everything is going. It’s pretty hardy. The color makes them come out looking kind of like blueprints which was a mistake. They ran out of black and blue was my only option. I was doing a large ceiling with the help of a friend and they said “Oh it’s like a to-scale blueprint of the building,” and I liked that. I like when things turn into other things, that’s always a very exciting potential of art for me is sort of that it can break those rules and it doesn’t have to be one thing. It can break rules that you can’t really break in the real world. It can kind of move into a mysterious or fantasy space. Erin is also doing rubbings with graphite, and experimenting with their shape. 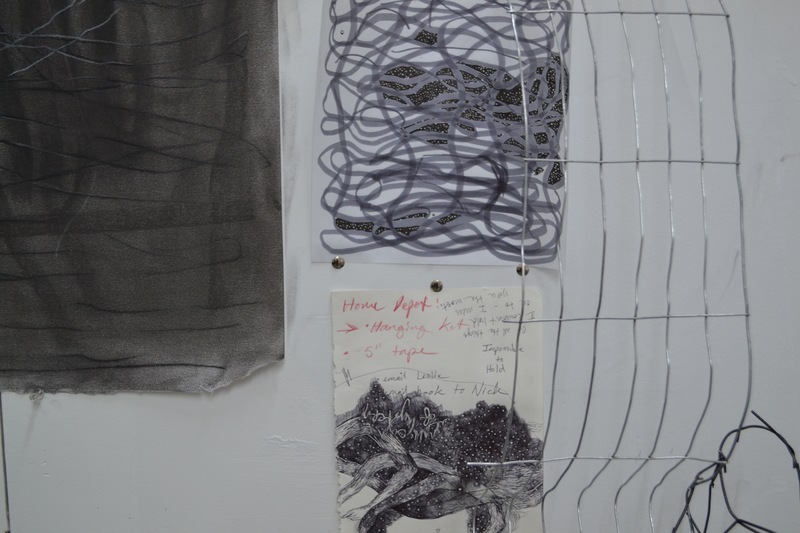 She has constructed wire sculptures to aid in the exploration of how shape and placement can alter the experience of the rubbings. Erin is also working together with another artist to produce an artist’s book, and aiming for completion this fall. Her drawings that will be included are small and intimate. They are saturated with detail and mirror her larger bodies of work through their themes of nature and deterioration. E: I feel like these are almost…personal. Drawing for me is a lot easier to make more intimate to me, probably because of scale. I can work on them anywhere and work on them for a really long time. And I think they help me think about what I want the other work to feel like. I started making these a long time before I started making the wire structures. I think I end up looking for material that feels like the line that I want or the movement I was getting at. We also talked about her paintings, which are equally as intimate and saturated. You could describe these paintings as poetic unironically, and I think this comes from its sincerity. When made honestly and free from influence outside of the artist’s gut, a painting can warm you. A painting can take what the artist has given it and bounce it right back onto your chest. E: Painting let’s you work out things, things that you wouldn’t expect. There are mysteries. I still find that really gratifying, not knowing where something is going and getting comfortable with that. I’ve come to a point in my life where that is what art is for, for me. And it is also fun to sometimes make things you can explain to people. S: Is there any explanation for these paintings? Or are they just paintings? E: They’re just paintings. I think of them all as excerpts from fictional landscapes. They are excerpts of this weird glowing watery world, but they don’t have specific narratives. They’re almost storyboards for something. Like if you’re looking at a movie and flipping through the inspiration sketches and they’re just trying to create the atmosphere for where all these activities will take place. They’re just trying to create this weird world. They’re all in this one really specific environment.